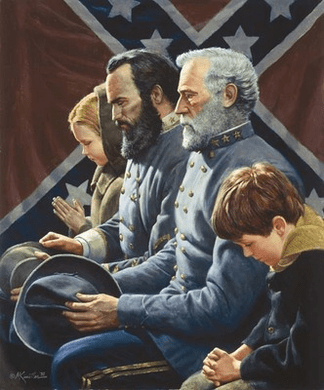 Mort Kunstler Handsigned and Numbered 2010 Masterpiece Collection Giclee on Canvas:"The Generals Were Brought to Tears"
Edition: Artist Signed and Numbered, Limited Edition to 50 with 15 Artist Proofs. About the Art: The Masterpiece Collection - an extrordinary selection of Mort K�nstler most treasured and timeless images. Personally selected by the artist, this unsurpassed art is prestigious, exhibit-size format designed for display as the centerpiece décor in any fine home and office. Today, this remarkable print is almost impossible to find at any price. Now, for the first time, The Generals Were Brought to Tears is being offered as a giclée print on canvas. In my continuing search for new painting ideas, I always look for exciting dramatic moments, and events that have never been portrayed before. When I read Lee's biography by Douglas Southall Freeman and came across a description of Lee and Jackson at a religious revival during the winter of 1862 - 1863, I felt I had a chance to combine both of these elements. On an estate called "Belvoir," just south of Fredericksburg, Lee and Jackson attended one of those prayer meetings. They were said to have been sitting side by side, on a log, "moved to tears one Sunday by the affecting eloquence with which Reverend B.T. Lacy described the homes from which the army had been drawn. To show both of them in such a poignant moment was, I felt, an opportunity for a memorable painting. There were always children at the winter camps and I decided this was also an opportunity to paint my grandson, Tommy, alongside the two great ones. Lee was wearing his uniform of that period, with a standup collar and his three stars with no wreath. Jackson was wearing a new uniform given to him by J.E.B. Stuart. It had a buff white collar and cuffs and sleeve gilt. He was wearing the butternut cap with 152271 trim that was given to him in December 1862. It is well known that both men were religious. This portrayal of two of the Civil War's most notable heroes is in sharp contrast to the fighting men usually portrayed on canvas. I hope this will add to the overall breadth of the images of them that I have been painting for the last ten years.